SolSuite Solitaire 2013 Game - Download and Play Free Version! Learn How to Play Over a Hundred Different Variations of Solitaire! Who doesn’t enjoy a round of solitaire? It may not be the flashiest thing on the market right now, but it’s still one of the best diversions in the entire world, it has been for well over a century, and it doesn’t require a supercomputer to run correctly. Best of all, there are almost an infinite number of possible games that can be made from a simple little deck of 52 cards. You obviously won’t get that many with SolSuite Solitaire 2013, but just scratching the surface will still give you more than you’ll know what to do with. Let us be honest; how many different variations of solitaire have you really played? How many of the above have you even heard of? If you answered “not a lot” to both of those questions, don’t turn away just yet. SolSuite understands that it has more games than you ever thought were possible. Thus, it features an assortment of tools that aim to teach you everything you need to keep your solitaire-playing days long and entertaining. Read up on everything you would ever want to know via the index, including the object and rules for every single game in SolSuite. Turn Autoplay on and watch the computer play out any game you select. See if you can pick up a few new strategies and techniques from its example. If you get stuck, consult the Hint menu to see what legal moves you can make. It’s one thing to play solitaire. It’s a whole other to play it on your own terms. With SolSuite Solitaire 2013, you can alter how your game looks, rearrange the solitaire library in whatever way you see fit, and even make your own unique games! Access your favorite games quickly and easily by making a “Favorites” list. Set up your own personalized group of games so that you can categorize them the way you would like. 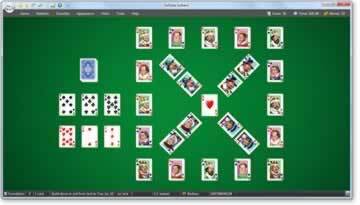 Create your own custom games of solitaire using the Rules Wizard. Determine the rules of the game, the winning conditions, how cards are stacked and arranged, and more! Decorate your cards with hundreds of different backings and themed images that depict animals, people, scenic locations, abstract paintings and more. Play your game to the backdrop of over 100 pleasant-looking background images. If the pre-built backgrounds and card pictures don’t do it for you, then feel free to add some of your own! Alter the cursor, skin, sound effects, and card animations. 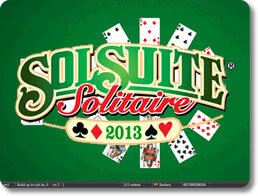 SolSuite Solitaire 2013 is undoubtedly one of the most comprehensive solitaire compilations ever made. Few others of its kind have nearly as many games as it. Even fewer can boast the sheer quantity of personalization that it allows. One form of solitaire is often enough to eat up hours of your time. Multiply that by over 500 and you have a game with unprecedented replay value. 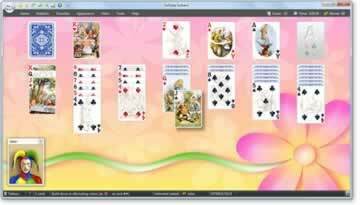 If you enjoy playing any sort of solo card game, then you absolutely cannot miss SolSuite Solitaire 2013.